Staying connected is both more important and easier than ever before thanks to a variety of advances in automotive technology. For this reason, our team here at Marion Toyota are so excited to tell you all about the new Toyota Entune system. 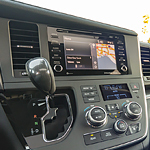 ?Select Toyota's include a JBL sound system which is a premium speaker provider that will have your favorite songs sounding better than ever when connected to your Entune system. Also, Entune has the capabilities to allow you to listen to satellite radio such as Sirius XM. This way, you'll always be able to catch the game or even listen to your favorite talk show on the way to work. Think this new Toyota Entune system sounds like something you'd like to have in your next vehicle? Then be sure to come on down to Marion Toyota located in Marion, IL to test drive a variety of different kinds of Toyota's as soon as possible!